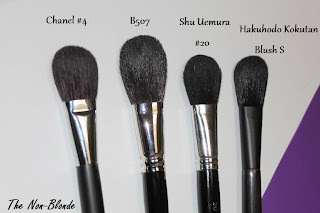 As far as classically shaped blush brushes go, Hakuhodo B507 (from the Basic series) is bigger and longer than most. 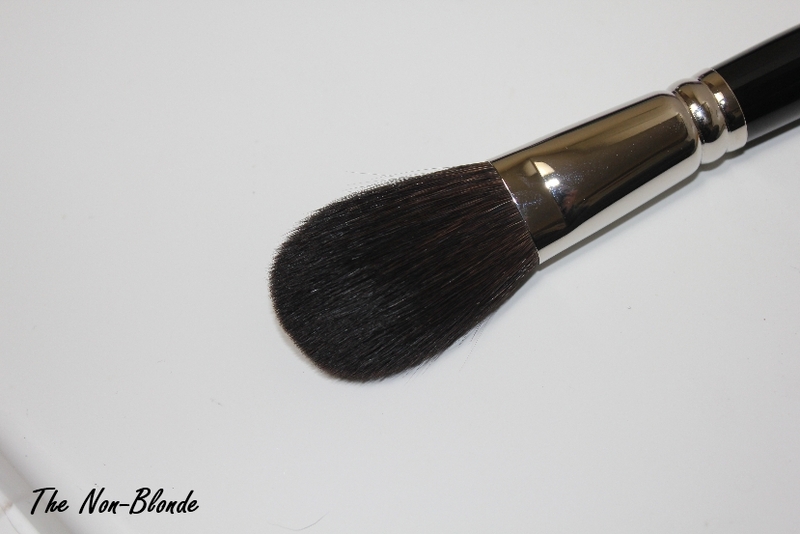 The flat paddle blush brush is a mix of blue squirrel and goat hair. It's a fabulous combination that ensures both performance and incredible softness. 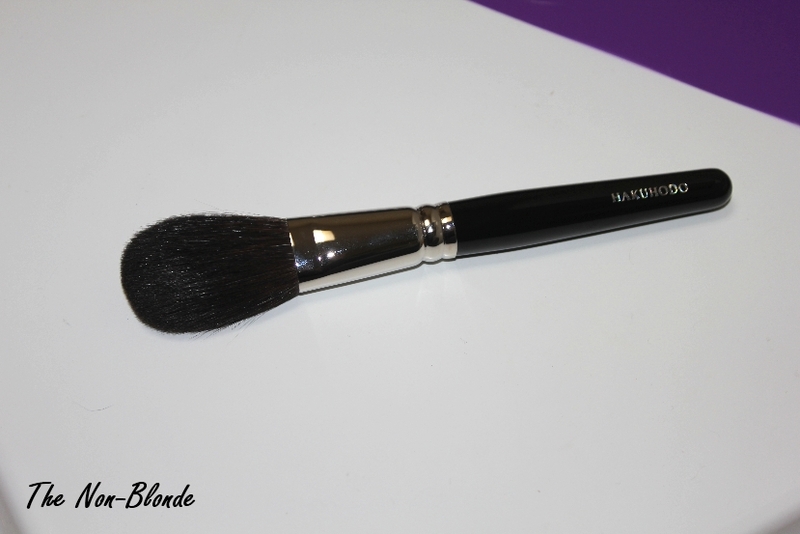 The feathery fluffiness of Hakuhodo B507 makes it great with intensely pigmented blushes. The brush will not pick too much products, and since the hair is so soft and not very densely packed, it will neither over-deposit nor will it create hard-to-blend streaks. On the contrary, it blends beautifully and creates a natural flush even when working with very red or plummy blushes. 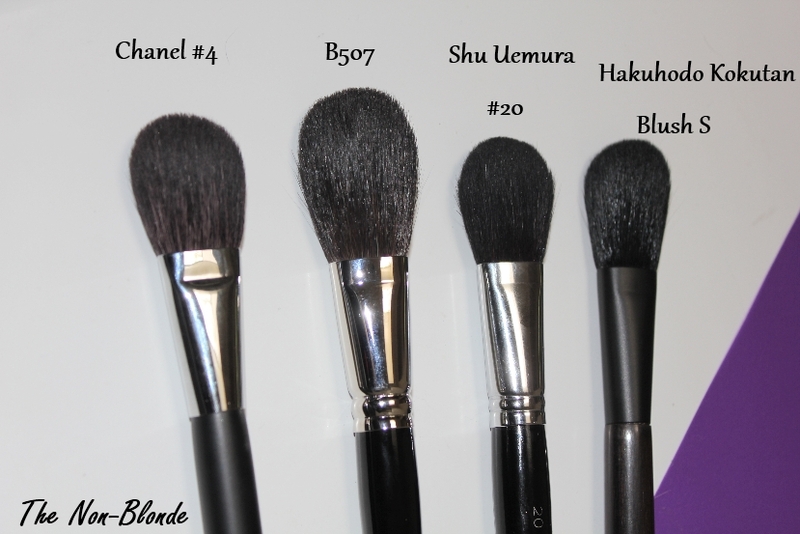 As you can see, Hakuhodo B507 is larger than its friends in my brush holder. 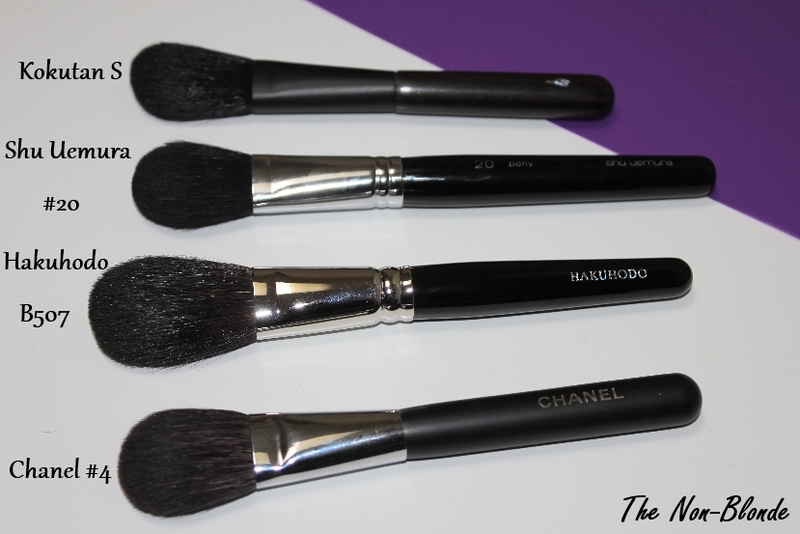 Longer than Chanel No.4 (new version) and Shu Uemura #20, wider than Hakuhodo's own Kokutan S, this is still a flat paddle shaped brush, so you can use the narrow side for actual application and turning it for blending. 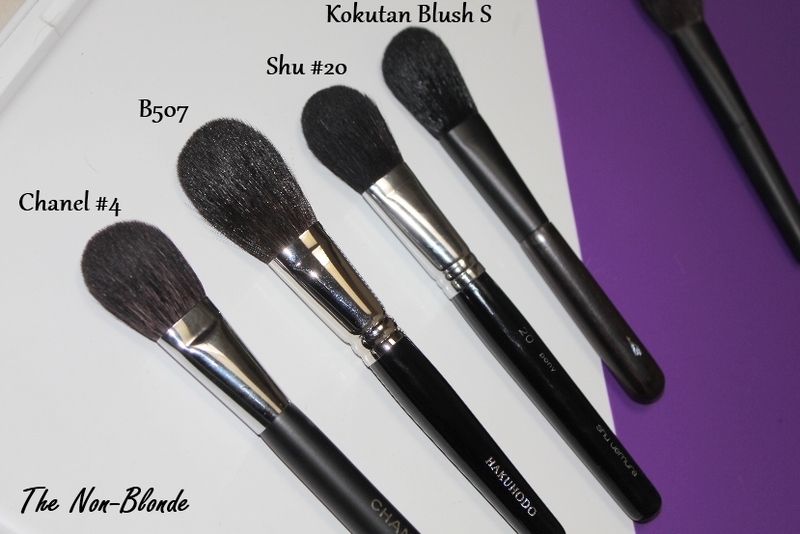 Compared to the beautiful Kokutan Blush S, B507 is packed more lightly and has a lot more give, for better and for worse. It's a matter of preference as well as the color product you're using. Some require a slightly firmer hand while others do better with this kind of heavenly fluff. Bottom Line: An excellent choice if you have too many dramatic blushes and an all-goat hair brush is too coarse for your skin. Hakuhodo B507 Blush Brush ($72) is available from hakuhodousa.com. They ship all over the world. Really interesting shape. This looks like a great alternative to using stippling brushes for pigmented blushes. A slightly off topic question. How do you store brushes usually? I have a few of those challenging blushes (hello Rouge by Chanel!). Would you say this or a yachiyo would be better to have?